Cooler temperatures and shorter days bring on falling leaves and yellowing pond plants. Be sure to trim off any yellowing leaves from your plants and skim off any fallen leaves from the pond surface before they can drop to the bottom. Clean your filter traps often to keep the water clear of debris. If too much organic debris, like leaves, evergreen needles, and fish food are left to decay in the water, harmful nitrogen levels can develop. Plants will be shutting down for the winter. Your fish, too, will be slowing down in the cooler water. Now is the time to cut back on fertilizer and on fish feeding. Repot your tropical plants and move them indoors before the temperatures drop below 40 degrees F.
If you live in an area where the pond will freeze over entirely, remove your pump and filters, and drain all of the pipes so that they don’t freeze. You can store them indoors in a freeze-free spot. Once the water becomes cold and/or ice starts to form on the surface, stop feeding your fish. They will survive the winter outdoors in deep water that doesn’t freeze, by staying in the warmer water near the bottom. They will need a de-icer or aerator to keep a hole in the ice where ponds freeze over entirely. This allows the exchange of oxygen and lets out harmful gases, critical for the fish to survive. This time of year is so beautiful in the garden. 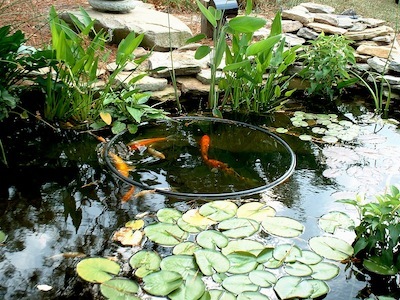 Let your pond duties entice you out to enjoy these cooler, sunny, clear days.